the KMT government. After a short stay in Hong Kong in 1950, my pregnant mother took her and her brother back Mei County, China, & in the same year her father followed the withdrawal of KMT army to Taiwan. Since then she & her family were separated forever from their father. Fearing that any connection with her father would bring disastrous discrimination in the following years of political disturbance, her mother had to cut off the correspondence with him. Her grandfather gave them refuge at his home, but his private business was soon confiscated, & they had to live together with their aunt, who was raising 6 children on a small income. Altogether, nine children depended on two women’s work. In the daytime, they did laborious farm-work; at night, her mother took up sewing to earn extra money. The image of her working in the dim light in the coldest winter & hottest summer is still vividly in her memory. As Bhiksuni Ming Hui tried to share some of the hardship at her tender age, but my mother died of overworking at the age of 56. Because of her lifelong accumulated good karma, she was led at her terminal stage by the light of Buddha into the pure land. People around were amazed by a variety of auspicious signs surrounding her death. The impermanence of unfortunate personal life situations strengthened my aspiration to relieve people from suffering. She actively participated in the Buddhist community while diligently studying Buddhist sutras. After China’s religious policy was relaxed she helped reclaim property for a lay Buddhist association. She was elected as its head in 1980. Later she went on a one-year pilgrimage before she formally became a disciple of Master Foyuan 佛源 in Yunmen Temple. During those days with her Master she assisted him in saving those historical inscriptions & prepared paperwork. Thus, the secular Hou Huizhen 侯慧珍 grew into the Zen Buddhist Ming Hui 明慧 . Building monasteries & nunneries became an inseparable part of her life in the past decades. Soon after she formally accepted the discipline of precepts at Yunju Mountain temple in 1985, she moved to Donglin nunnery to practice Zen while living a rural lifestyle. During that time, she helped with rebuilding the old nunnery. The most important part of her life has been devoted to the construction & management of Thousand-Buddha Pagoda Temple 千佛塔寺 in Meizhou. Master Yuanzhao planned in 1986 to expand the Putong Pagoda temple in order to take care of his five newly tonsured disciples, who were all at senior age at that time. Bhiksuni Ming Hui assisted by making applications for government approval. Unfortunately, the senior Bhikkhu passed away in 1988, leaving the construction unfinished. Invited by local Buddhists, she undertook the responsibility to continue with this work. Seeing the iron Thousand-Buddha Pagoda (built in 965 A.D.) unprotected in an open field, we decided to build a 36-meter-high stone pagoda to shelter this important Buddhist relic. Thus, the years long construction of today’s Thousand-Buddha Pagoda got started in 1990 & other monastic buildings afterwards. To solve the shortage of funds, Bhiksuni Ming Hui embarked on an international travel of fundraising: Jakarta, Bandung, and Medan (all in Indonesia) & Thailand in 1992, Singapore, Malaysia & Hong Kong in 1994, Taiwan & Macao in 1996. After a whole decade of hard work, we celebrated the ceremony of consecrating the temple in 2000. Soon we finished a building especially for the purpose of Dharma education. Today the temple is still in expansion to satisfy the demanda of an increasing Buddhist population. The other two monasteries Bhiksuni Shyka Ming Hui helped to rebuild are Dajue temple completed in 2003 & Xiangyun Temple 祥云禅寺 started in 2008. We not only expanded the physical structures, but more importantly renovated the long lost tradition of Zen practice in Meizhou. The Dharma training program started to teach Buddhism in 2000 & was accredited by the Bhiksuni Department of Yunmen Buddhist Institute six years later. In May 2004, she led resident Bhiksunis on a trip of mendicancy, through which they re-experienced the ancient Buddhist tradition & increased public confidence in Buddhism. In 1999, Bhiksuni Ming Hui organized a Buddhist choir group & started to use singing performances to reach a larger population. In her temple, lectures on traditional culture & Chinese classics are offered on a regular basis. From July 2007, a retreat camp for college students has been a yearly event. A vipassana mediation training program started in June 2006. With the meditation building completed in 2010, Bhiksuni Ming Hui is able to provide a retreat for 250 people at the same time. Thousands of people with various faiths have so far benefited from this ten-day program popularized by Master S.N. Goenka. Practice Base of Religious Studies of Renmin University, China established in 2008. Poetry Anthology Ming Yue Chang Feng Qian Li published in 2012. In 1997, she established the Ci Ji Charity 慈功德会. In that year alone, we raised RMB200, 000 & donated all of it to the victims of “9710 Typhoon” in Meizhou. In 2001, she started a sutra chanting group to pray for terminally ill patients. In 2010, she helped establish a volunteer organization of local lay Buddhists to serve the community. 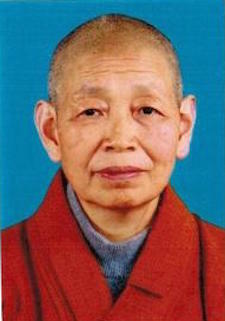 Bhiksuni Ming Hui founded the Institute of Zen Culture of World Hakka City in Meizhou in 2012. The positions she holds among Buddhists include: Director of the Chinese Buddhist Association, Vice-President of the Guangdong Buddhist Association, & President of the Meizhou Buddhist Association. Other provincial & local offices she holds are: member of Guangdong People’s Political Consultative Conference, Member of Standing Committee of Meizhou People’s Congress, Member of Meizhou People’s Political Consultative Conference, & Executive Director of the Red Cross Society of Meizhou. 2001 the World Buddhist Sangha Council in Indonesia. 2006 the First World Buddhism Forum in Hangzhou (Zhejiang, China). 2007 the Dharma Assembly Gratitude for China, Bless China, as part of the celebration of the 10th anniversary of Hong Kong’s return, along with 60 Bhiksunis from her monastery who put on stage an impressive demonstration of monastic demeanor. 2009 the Second World Buddhism Forum in Wuxi (Jiangsu, China).